Long queues, harried customers, and lots of questions. Here are some difficulties the aam aadmi is facing as a result of the Modi Sarkar's ban on Rs 500 and Rs 1,000 notes. Rediff.com's Prasanna D Zore reports. 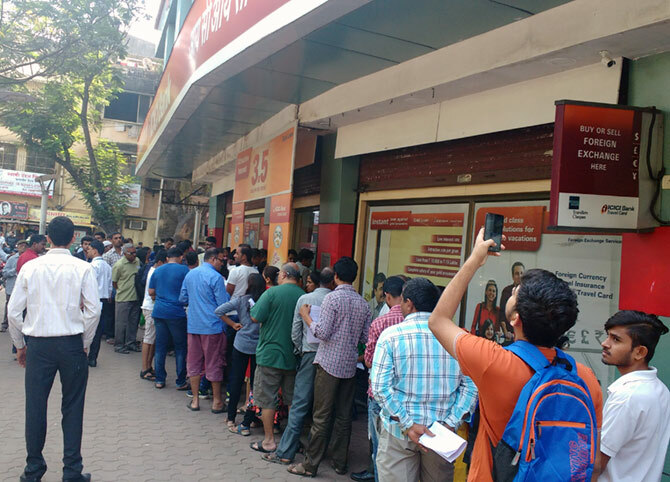 IMAGE: A long queue of people outside the ICICI Bank's Malad West branch in north-west Mumbai. There were two separate queues: One to exchange Rs 500 and Rs 1,000 notes, the other for depositors. Jimit Dadha, his wife and his father took turns on Thursday, November 10, morning to stand outside a bank to exchange as well as deposit Rs 500 and Rs 1,000 notes that ceased being legal tender on the midnight of November 8. At 10 in the morning, Jimit was standing in front of the ICICI Bank, Malad West branch, northwest Mumbai, to exchange the denominations that have been demonetised. "My wife stood in the queue from 8 in the morning. She left just now to take my son to school," Jimit, who replaced his wife in the queue, said. Should his turn not come till noon, his father will substitute him in the queue. All three family members have the exchange forms filled in their respective names with all the details. "Whoever gets lucky while standing in the queue will help manage the household expenses for the next few days," Jimit added. IMAGE: Hitesh Dedhia will lose a day's pay because he had taken leave to exchange the Rs 500 and Rs 1,000 notes he had at home. 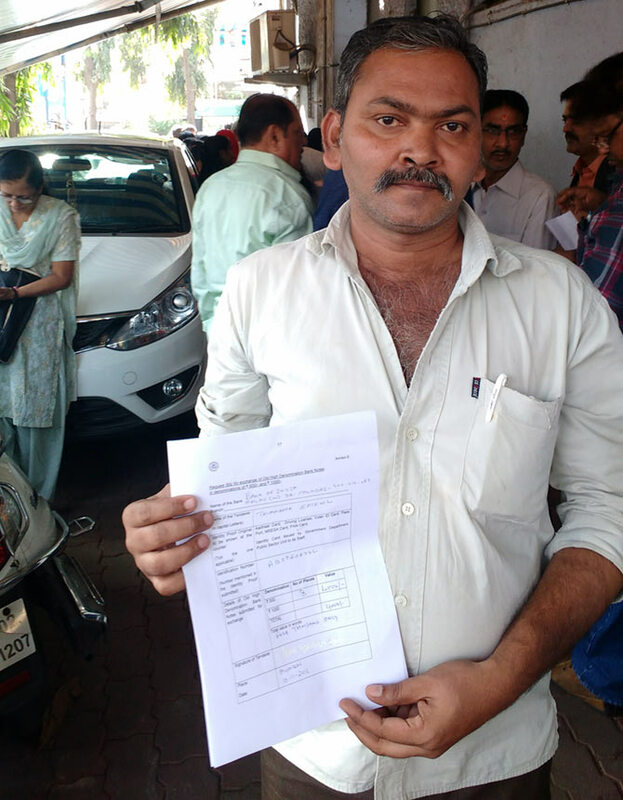 Like Jimit, Hitesh Dedhia (at the ICICI Bank, Malad) and Thimmappa at DCB (Malad West) have queued up since 9 am to exchange Rs 4,000 -- the maximum permissible limit the government has allowed till November 24. "It might take another hour before I get to exchange the Rs 4,000 (8 notes of Rs 500) I have," says Thimmappa, a businessman who trades in iron scrap. Thimmappa took the help of people around to fill the form issued by banks for exchanging the banknotes. "Why this hassle? Why stand in a queue for no fault of mine?" he asked. IMAGE: Thimmappa had no clue how to fill the form available for the exchange of Rs 500 and Rs 1,000 notes. Hitesh, too, has come to exchange Rs 4,000 (6 notes of Rs 500 and one note of Rs 1,000) that he had at home when Prime Minister Narendra Modi addressed the nation at 8 pm, November 7. "I was shocked that the government was giving so short a notice to people, but then heaved a sigh of relief to hear that we actually had time till December 30," Hitesh, who works for a courier company, said. The government, he said, should have given people more time to get these banknotes exchanged or should have devised a method to get the deposits and exchange of notes in a hassle free manner. "I will lose a day's pay," Hitesh, who has taken leave, said. "While liquid cash will not be a problem after a few days, I am worried how I am going to run my house for the next couple of days. Nobody is willing to accept Rs 500 and Rs 1,000 notes for vegetables and daily groceries." 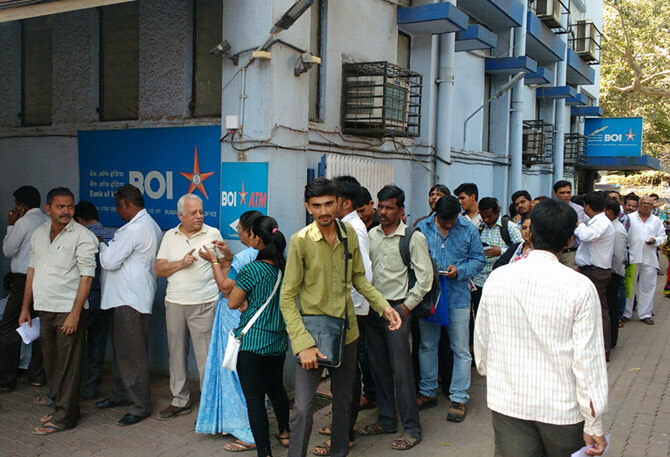 IMAGE: The queues were longer outside PSU banks as compared to private banks, which were better organised. Jimit too had taken a day off. He had no choice because the six workers at his plastic factory were on leave. "They had some banknotes to exchange. Nobody was taking these notes from them as everybody fears long lines in front of the banks to get these notes exchanged." 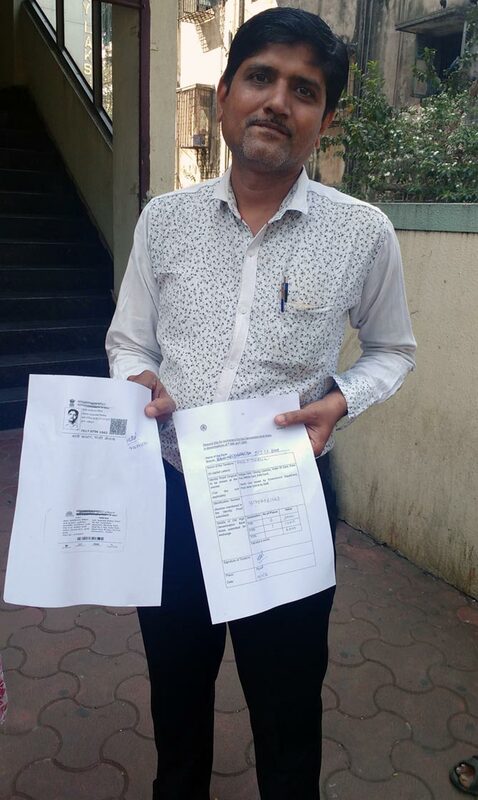 Jimit, who deposited Rs 200,000 last week, was worried that he may face scrutiny from the tax authorities, and so refused to be photographed for this report. He still had to deposit another 100,000. 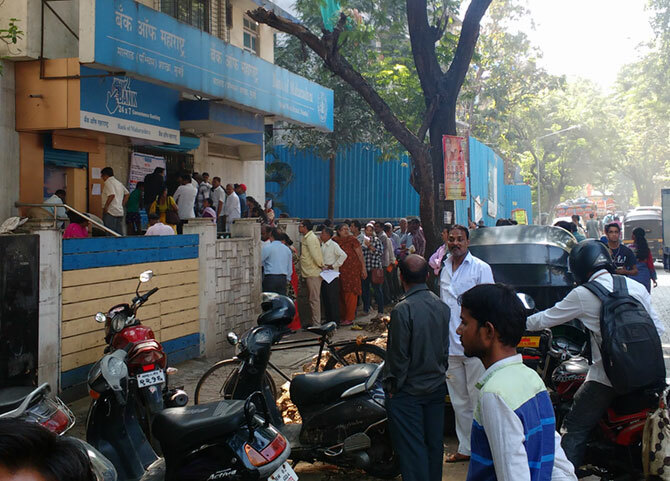 IMAGE: A long queue outside the Bank of Maharashtra branch in Malad West. "I am not afraid because I have legitimate money. But the problem is," he said, "in India, you face harassment from the tax authorities for no reason." "Did we create the black money?" he asked, "Then why should people like us face this inconvenience? Those who have stashed ill-gotten wealth should face the music, not us."